Their ability to be this happy, while living with so little, opened my eyes to what’s really important in life. "As I'm writing this now I'm realizing how hard it is to put my emotions into words. This trip was truly the best experience of my life and I am so thankful for the impact that these children have had on me. 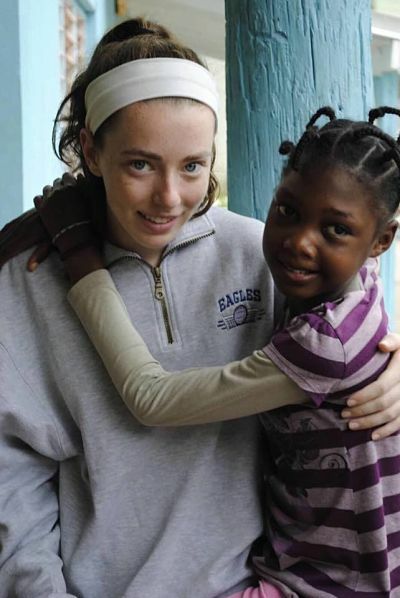 When we first arrived in Jamaica I was unsure of how I was ever going to make a connection with the children, when I felt so distant from them. But the immense love and incredible happiness that they showed me made it impossible not to feel a connection to them. My eyes were opened to the pure joy that these children have for life and for everyone around them. Throughout the week I found myself becoming so much happier because of them. Whether it be Okiliah running up to me and giving me a big hug, or Donovan, the sweetest boy who would sit on your lap and start singing to you, I was amazed by these children, whose happiness surpassed anything I had ever seen in my life. Their ability to be this happy, while living with so little, opened my eyes to what’s really important in life. I began to realize almost immediately how blessed I am and how grateful I should be for everything that I have. Now that I’m home, I find myself thinking about the children or looking at pictures of them all the time, and if I’m having a bad day, this instantly puts a smile on my face and makes me feel better. These kids have touched my life in more ways than I could have imagined and I hope that I can spread at least a little of the unconditional love that they showed me."